Days Of Our Lives Spoilers: Kate Controls Sami – Won’t Let Her Forgive EJ – Did Kate Send Sami the Pictures of Abigail and EJ? Days of Our Lives have characters coming and going (mostly going) but even so fans are growing tired of Sami’s revenge plot against Abigail and EJ, and they aren’t the only ones! Even Sami’s own son has told her enough is enough. Sami and EJ have a long sordid past, and they seem to always wind up back together. There have been a few fleeting moments when Sami almost seemed to want to forgive EJ, and according to Days of Our Lives spoilers in the August 11th edition of Soap Opera Digest, there will be many more. DOOL spoilers tease that Sami will begin having second thoughts about what her marriage to EJ has become. Alison Sweeney told Soap Opera Digest, “Sami is having all these wonderful thoughts about the good things that EJ has done for her and how she pushed him away because of the lies with Kristen.” Sweeney goes on to explain that Sami will reveal to Kate that she is beginning to have second thoughts about making EJ’s life a living hell and stealing DiMera Enterprises. Kate doesn’t want to hear it though, and she forces Sami to look at pictures of EJ and Abigail to remind her of why they are doing all of this. 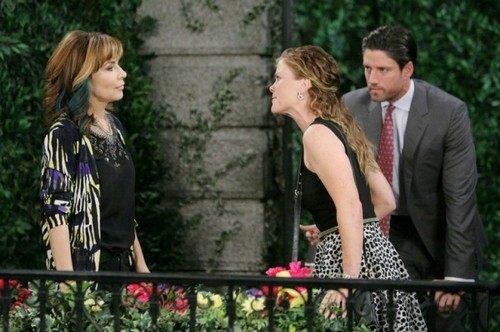 Basically, Sami is ready to bury the hatchet with EJ, but Kate refuses to let that happen. Kate has a lot to lose if Sami bails on her, like her new room in the DiMera mansion and her CEO position at DiMera Enterprises. It was revealed a few weeks ago that Nick’s lawyer sent Sami the photos of EJ and Abigail, but we can’t help but wonder if it was actually Kate that made sure the incriminating photos made it to Sami. What do you think Days of Our Lives fans? Will Sami get out from under master manipulator Kate’s thumb and bury the hatchet with EJ? Do you think Kate might actually be the one who sent Sami the pictures of EJ and Abigail? Share your thoughts and theories in the comments below and don’t forget to check CDL tomorrow for more Days of Our Lives spoilers.